It's been about two years since I last painted one of my characters on a wall. Two years in graffiti-time is like two lifetimes. I've been missing it. Why such a long sabbatical? Life. Life just moves on, as some things become more important to me than others. I don't mind that, actually. I'll be the first to admit to other graffiti writers that graffiti is not my lifestyle, and I've received nothing but love from them for being honest. 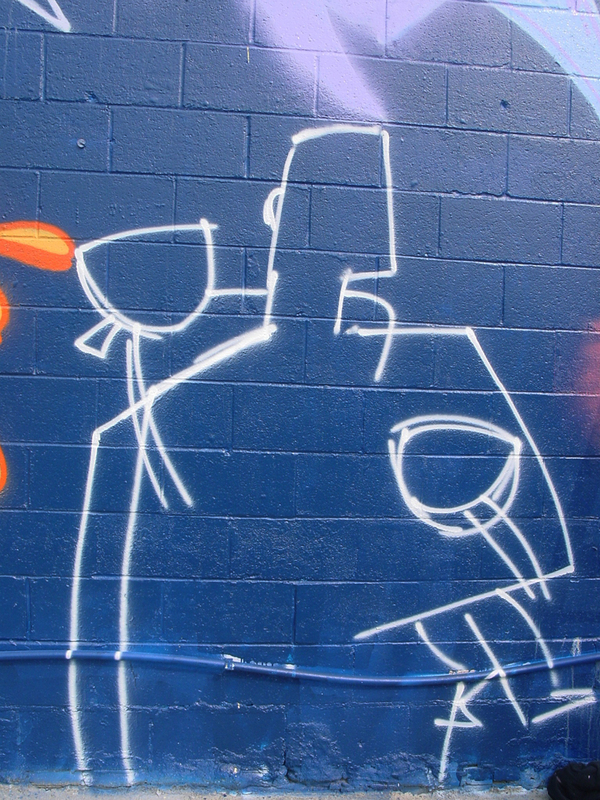 Graffiti takes time away from the family, and I value my family more than anything. I'm not trying to be something that I'm not, and other writers pick up on that, and give me respect. So, it's been two years since I've been out there and imagine my surprise when a get an email out of the blue from a graffiti writer here in town asking me if I'm free to paint the following Sunday. He got permission to paint an entire wall that's on the side of this automotive place in Marietta. 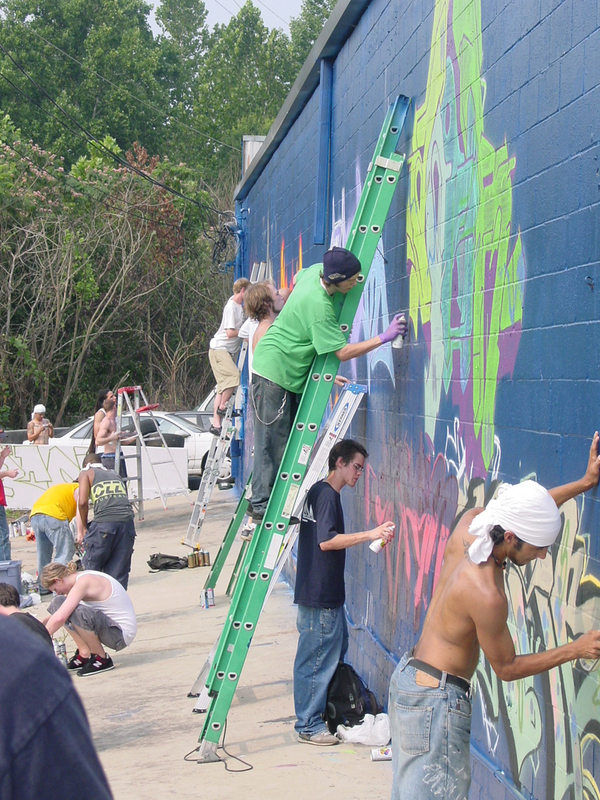 Not only was the size of the wall impressive, but the roll-call of writers that were expected to show up and paint was equally amazing. Some old school cats along with some mad talented newer faces -- I immediately said yes. I was back in! My style of characters are not the typical 'hip-hop' style of characters that you usually find on graffiti productions. No b-boys in a buffalo stance, no big eyes, no big shoes, no baggy pants, no bling and the like. I felt why do something that everyone else has seen countless times? I was getting rather sick of all that. The lines became something that I could manipulate to my advantage, and now has become my signature look. Occasionally I'll do something different, but this chunky, blocky style with the thick, straight lines is what people expect from CANON. As you can see in my initial drawings, the lines are thinner and less strict. More free-flowing. Actually, I wish that I could paint my lines like this, to tell you the truth, but I know that that would require more can control than what I possess right now. Plus, I would need a much larger space. I've had some graff writers tell me that they didn't like my characters at first, but once they saw more, they eventually warmed up to them. And now, they love them. It's all part of that notion of getting stretched and pulled out of your conventional box -- your comfort zone, if you will. These are not your typical graffiti characters, and if that's what you're used to seeing all the time, of course you may exhibit some trepidation at first. So, I had my brother-in-law, Nate, come along with me to Marietta to take some photos for me. It's a rarity for me to have some actual shots of me painting, plus I thought it'd be a cool thing to post on The Ward-O-Matic. I know that most people view this activity as criminal, but since this is a permission wall, wherein the owner of the building gave us permission for us to do our thang on the wall, then this is completely legal. For the record, I've never done any illegal graffiti. All my characters that you see in my gallery and in my Flickr were all done on legal or permission walls. I've got too much at stake to be screwing around with any illegal activity. If that shoots my street credibility to nil, then so be it. I don't care. I don't want Ava to ask "Where's dada, mommy?" And Andrea answers, "Well, honey, he's in jail for painting on somebody's wall." Not for me, thankyouverymuch. Like I mentioned earlier, we had a great turn out. The wall was so big that ladders were needed in order to fill up as much of the space as possible. There was not much space to walk around in, as there was this steep ravine right behind us, filled with kudzu. Welcome to the south. Checking the paint situation. 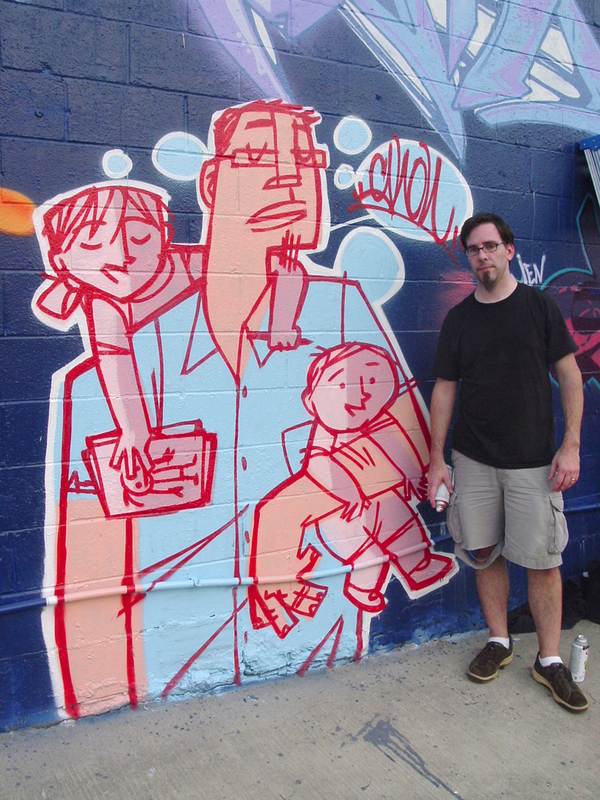 Nate said that I should be saying here, "Here I am, a 36 year-old grown man... and I'm painting graffiti." Lookit, I'm already sweating. I start with a sketch of the piece, to make sure I've got the composition and proportions correct. I then begin on the inside fills. Not all that fun, but necessary. After I get all the inside fill colors, I then paint a white outline around everything. I have to be careful not to get too sloppy with the line, as I don't have any of that dark blue paint to go back and fix any mess-ups. Next, I do the red lines. In order to control the lines, to shape them just the way I like them, I do what we call "cutting the lines." I have a can of the fill color and I "cut" into the red line, to thin, or shape it how I want. Mostly I trim the ends, to make them flat. Looks nice. I like it. Finally done. I am one worn out old dude. Here it is. Me and the kids. I'm happy with the end result. Even though the lines are thicker and not the same as in my original sketch, I have to understand the process and know that it's not going to be perfect each time. Under the circumstances, I'm happy with the piece -- especially since I've been absent from the graff scene for two years. Hope you all enjoyed seeing an old dude getting back out there. It was a great experience for me. Finally got it out of my system. Hopefully, it won't be another two years until I get out there again. Be sure to click HERE, to check out the entire photoset on my Flickr. There are more photos, if you're curious. Enjoy! Nice! Just like riding a bike, eh? Awesome! I was really digging the concept illustration that you did for your graffiti painting and was anxious to see how it turned out. VERY nice! Watching you go through your process is amazing. If I make it out to Atlanta, you'll have to give me the CANON tour, taking me to all the different locations of your work. Great post! Well, it'll be a short trip, as this is the only one that's up and running now. That's the way it goes with graffiti. And, Jamie -- surprisingly, it was. It was exhilarating. Wow! 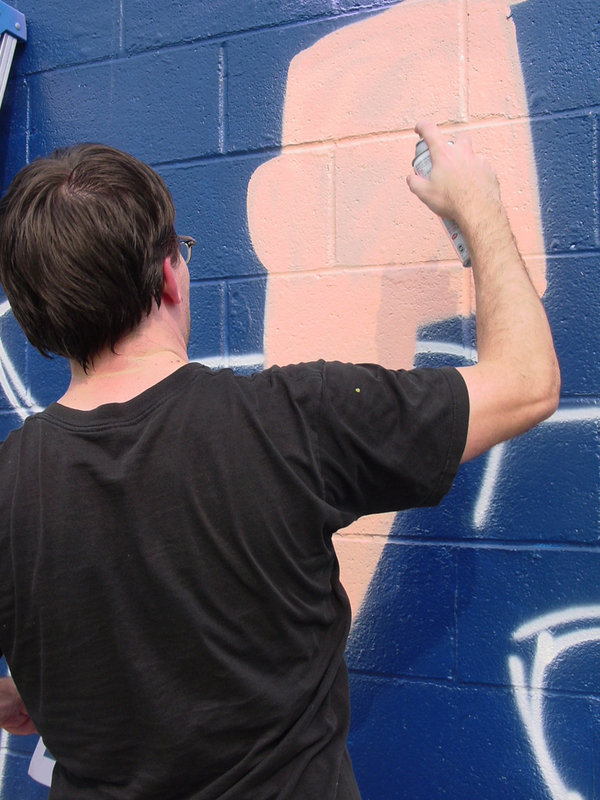 Your style translates surprisingly well into graffiti. I was sitting here saying, "he's gonna do that with SPRAY paint?!" But you did and it looks great. I love it! A great contrast to traditional graffiti art. I really enjoyed seeing your process. Interesting that it was so planned. nice post ward and nice piece! 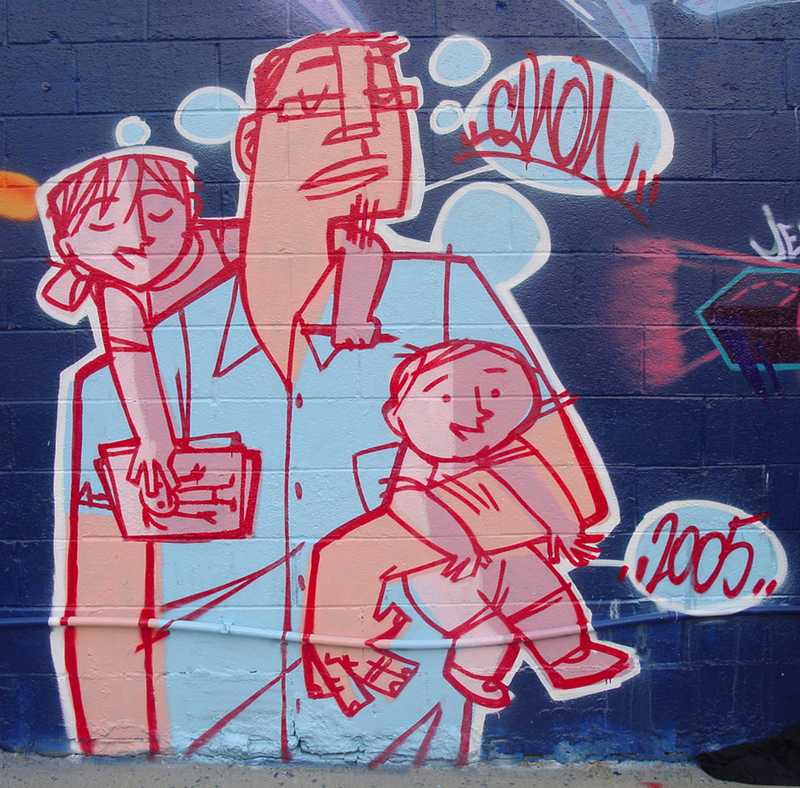 it's about the least graff-cliche subject matter i can imagine, which makes it all the sweeter. i imagine looking down the length of the wall and getting the common "down with the bourgeois! screw the man! rebel, style wars" vibe then landing on your piece... quietly and confidently glowing, like "hi, i'm the bourgeois man with my beautiful kids, i'm happy!" it's about the most punk-rock thing imaginable. Very impressive. The cool hues in the beginning create a nice effect too. What's neat is the section of wall you got has some wrinkled-up-shirt look at the bottom. It's great though. So you don't vary much with caps? you just cut in with the color? Whatever works right? I've been out of the scene much longer..don't feel too bad, you still got it! First, let me say I think this is awesome. I love the graffiti. Next, everyone I've seen working with spray paint on the home and garden channel or on the sidewalk in New Orleans wears a mask to protect their lungs while spraying. I notice you don't. Is it not really necessary? Lookin' good, Ward! As far as the legal issues go, the bottom line for me is whether it's good or not. I dig the paid productions of TATS (Fat Joe's crew), and can appreciate incredibly ballsy antics of Cope 2 (dude, have you ever seen Kings Destroy? Nuts!). Personally, I too, have a healthy respect for the law, so I don't bomb. I've dropped the odd sticker here n' there, but nothing major. I was wondering...what was your introduction to writing? Thank you all, for the comments. It was so great to get back out there, I tell ya. sdyoung -- I use NY fats for the fills, and German thins for the detailed linework. I'll use NY thins for some of the bigger cutting details, such as shaping in the fill colors. I'm still needing to work on some of my can control, as I feel that I'm not utilizing the caps to my advantage. That's what happens when you don't have a mentor, I guess. cate kelly -- you're right, I should've had a respirator on (the mask). I do own one, but did not bring it. Don't know what I was thinking. Considering that my pieces are not too involved, I don't usually need it, whereas the other guys tend to work on larger pieces, taking longer. But i'm making excuses here, so now I'll stop. Hey there Allan, thanks for the comment. As for my introduction to graffiti, rest assured, you'll find out soon enough. 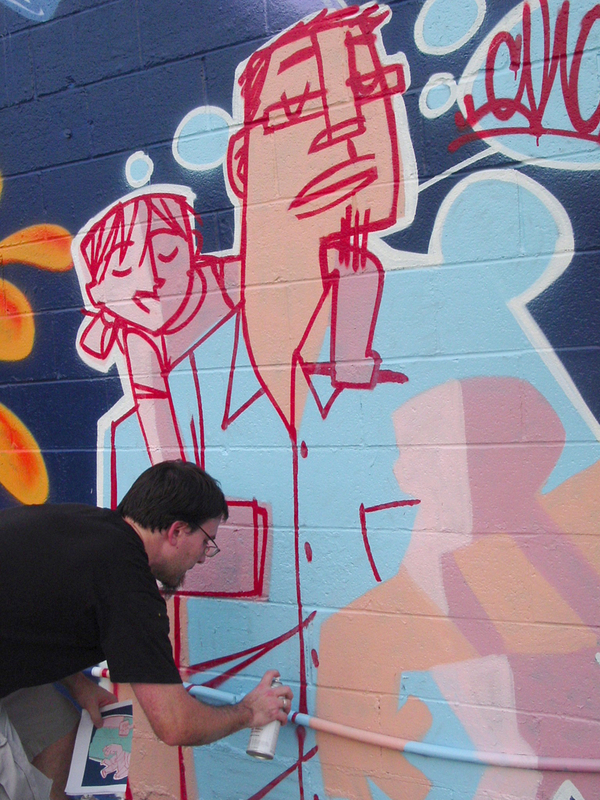 I'm working on a post about my thoughts on graffiti, including how I got into it. so cool ward! loved seeing the process and i think your style is very unique and refreshing! love the color choices too. i'm going to have to link to this! ummm....er.....if i could have your permission that is to take a picture to post and link? No problem, Jan. Go for it. And thanks! 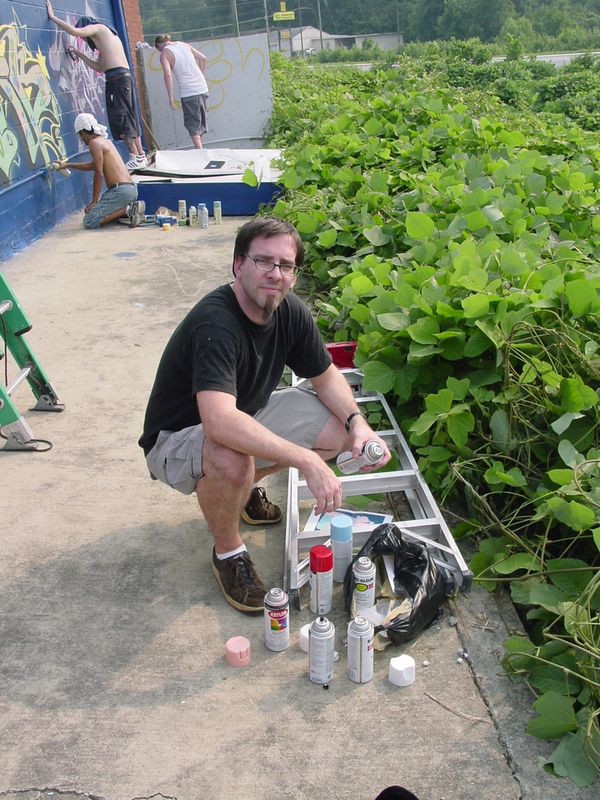 I'm working on a post about my thoughts on graffiti, including how I got into it. loveloveloving it. I know it was not the easist thing to work out (in terms of time and transportation) but It sure is fantastic to see you up again. Hello. Your art style looks like the kind in cartoons, thats cool!!! hey...from one artist to another, take a look at my artwork and do you think I could sell my art one day? LOL Its ok if you think not. Pretty nice graffiti you've made there! I'm a bit that worry some cops may recognize it as a form of vandalism! Let's hope that doesn't happen to you though! I just wanted to say that I love your art, and your honesty about your family life. I am a stay at home mom and I paint and it's impossible to remove my life from my art. It's great to hear a daddy talk that way too. BTW where is that wall in Marietta? Cuz that's where I live. 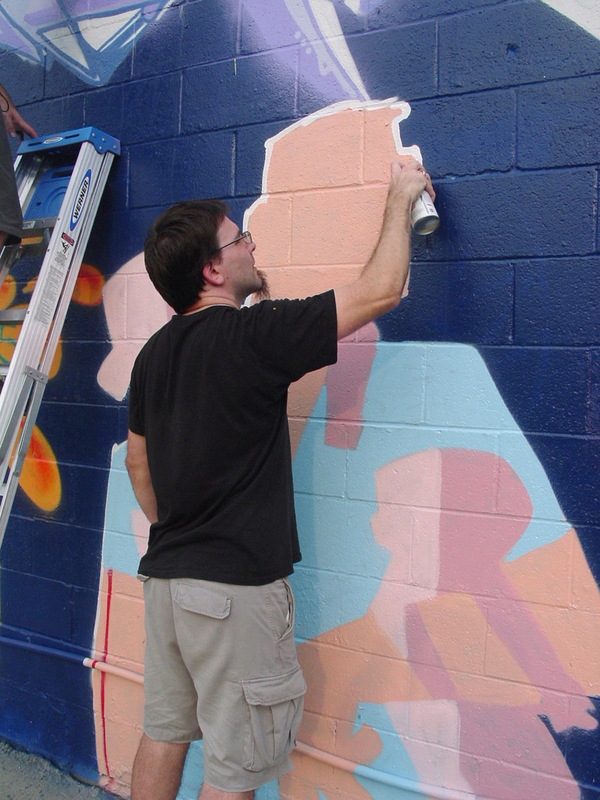 Glen, being that this was a 'permission,' or legal wall, the owner gave us permission to paint on his building. In fact, he was right there watching us, completely enthralled by it all. If you go to my Flickr photoset, you can actually see the guy hanging out on a half-wall -- an older asian man. He was a really nice guy. KatieK, thanks for the compliments. You can find the wall on the side of VT Automotives, at 1155 South Cobb Drive. It's on the left side of the road if you're going south. Wow! I'm blown away! That's the best large-scale work I've seen since Denny Dent died. man oh man. i am just in shock. not only do i love your art, but you graffiti too?!? you are a very talented guy and i love your work you did on the wall. i just came back from a weekend trip in New York. boy did i get my fill of graffiti and then some. also got some awesome pix. those guys are so talented, i have so much respect for their style and the places they put them....amazing! nice job thanks for sharing! I love it!! It's great!! That piece is dope man!